Over at PatternReview they’re running a contest called the “Surprise Sewing Bee”. 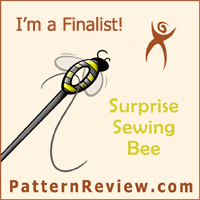 Each week there is an assignment that the contestants sew up, photograph and write about. Then they are judged….and some are eliminated. This is week one, the assignment is to sew an A-line skirt, and of course I had to join in. I love entering things like this because it gets me to think outside my cozy little box. I started off thinking of just making an A-line with something different. How about a front zip? I cut it out and went to bed. Woke up at 4:30 am thinking duh, am I thinking? It’s an A-LINE… sounds like a train route…or a subway route… remember to mind the gap. So I cut out a denim skirt using the Maria Denmark Yasmine Yoke Skirt pattern. I like this one because it sits lower on the hips with a curved waist band. I’m very short between my waist and ribs, so normal waistbands end up binding my rib cage – ouch. Plus, this pattern has pockets – yay! I was going to applique some train tracks on the lower hem edge but the time involved with that was just too much. Instead I found a quilting fabric from my stash that looks like tracks – black and off-white slightly squiggly uneven stripes. I made a double-sided interfaced band to extend the hem but didn’t attach it like a normal band. I hemmed the denim as normal with my coverstitch machine. Then I sewed the band inside as a second, lower layer hem. It almost looks as if it’s an extended lining (this fabric would make terrible lining fabric). With the two layers to the hem there is a “gap” as in “mind the gap”. Then to both accent this and to add further reinforcement to keep the band from turning back I used yellow 6-strand embroidery floss to make a warning line like you see at the edge of a subway platform. I used the same floss to make dashes at the pockets, too. A train needs a route, so I made some bias tape with some red chambray (same fabric used for the pocket linings and waist facings). I wrote out the word A-line with the bias tape, fused it down and stitched each looong edge. It circles the bottom of the skirt – makes a complete route. The “i” is dotted with a doubled up red and white button. The contest requires a lining, but this pattern doesn’t include one, so I fashioned my own out of some steel grey poly lining. The lining has a rolled edge hem and is made to be the length of the denim portion of the skirt (I didn’t want the tracks part lined). Now I know that most people looking at this won’t know what in the world it says (Aline? her name maybe? ), but who cares? This was so much more fun to make than a normal skirt, and it’s one of a kind. It’s a win!